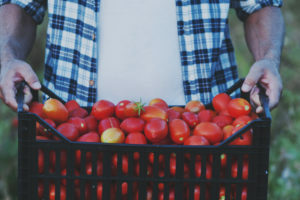 With so many choices, you may be wondering how to choose the right tomato? The flavor is based on the plants acid and sugar levels. Most tomatoes are the same or close to the same in acid levels. It is the sugar that changes the flavor. High levels of acid with a low level of sugar creates an acidic flavor while high sugars and low acid gives a sweeter flavor. If it is low and in both acid and sugar you get a bland flavor. The majority of people prefer high acids and high sugar that balances the taste. There are many other factors that contribute to the levels and flavors including ripeness on the vine and your individual taste buds. Did you know flavors vary within the tomatoes on the same vine? The taste is greatly affected by your specific soil. You need to provide your plant with nutrient-rich soil. In order to to get maximum flavor, it will need plenty of potassium and sulfur. They also thrive in heat and sunlight which allows them to maximize photosynthesis and make carbohydrates that create a flavorful tomato. The best tomato is the one that you prefer based on your own preferences. On Natorp’s Nursery, where we grow 100 types of tomatoes for the Cincinnati garden. You want to find one that has the perfect balance of acid and sugar. Our tomato growing experts, created a guide to help you find the perfect one! Take a look at our Tomato Guide!